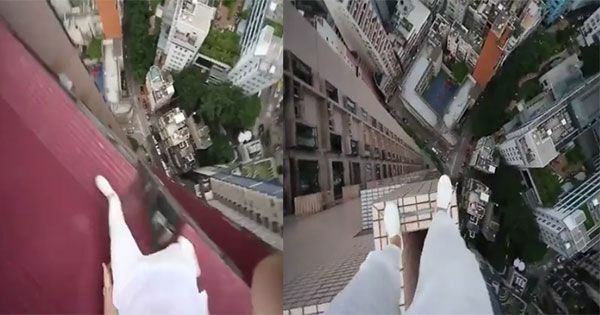 This video of a man walking on edges of rooftops of high-rise buildings has gone viral. Don't watch this if you are afraid of heights! Some of you may have already seen clips of stuntmen and daredevils pushing themselves to the limit, but this one will surely make you feel sick. The tense video got more than 49,000 views on Facebook since it was posted Tuesday by Anthony Rogers. In it, a man filmed himself standing and walking on edges of skyscrapers in an unnamed city. Completely ignoring the dangers, he steps and hops from one rooftop to another during the heart-stopping stunt as the camera pans down to the street below and on top of shorter buildings, giving viewers a vertigo. We warned you earlier and we are warning you again, do not watch this video if you have an irrational phobia of heights.